The Confederate Lion of Atlanta—often referred to as simply The Lion of Atlanta—stands at the resting place of approximately 3,000 unknown Confederate soldiers at Historic Oakland Cemetery, of which most were lost during the Atlanta Campaign. Underneath the Lion itself are boxes containing amputated limbs of Confederate soldiers. I know it sounds morbid, but we are talking about war and we're talking about a cemetery, albeit a beautiful cemetery. 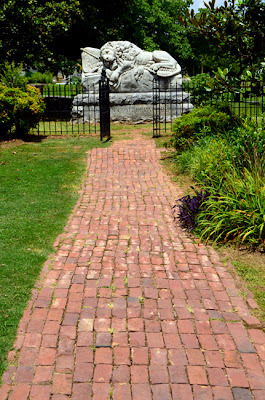 This memorial to the "Unknown Confederate Dead" was sculpted in 1894 by T. M. Brady of nearby Canton, Georgia, and it was sculpted from the largest piece of quarried Georgia marble as of that time...not a small feat! 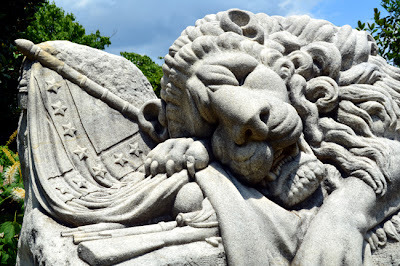 Brady was lauded for his beautiful work, save for a few who claimed it to seem too similar to the Lion of Lucerne, which also depicts a dying lion in a very similar position. Their lion monument was for the Swiss Guard who died protecting the French Monarchy—King Louis XVI and his wife Marie Antoinette—during the French Revolution. The sculpture was unveiled on Confederate Memorial Day in 1894—April 26 to be exact. There has been much speculation on the symbolism of the sculpture...the bottom line, as fascinating as all the speculation is though, is that it signifies the end of an era. It was given by The Atlanta Ladies Memorial Association. 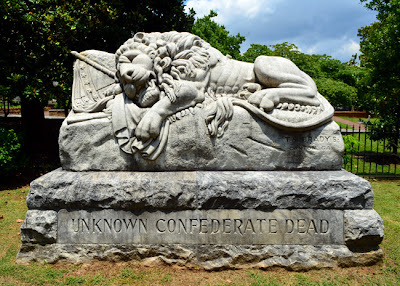 The Confederate Lion of Atlanta at Historic Oakland Cemetery is a must-see for any and all tourists. While you can see it for free, I highly recommend taking one of the guided tours...they don't cost very much and are highly informative...you've have to read at least a dozen book to get all the information imparted during one of their docent-led tours!